Since the publication of Raymond McNally's Dracula Was a Woman a quarter-century ago, no one has stepped up to write a solid and accurate history of the Countess Báthory Erzsébet in the context of her times -- with worthwhile documentation. A plethora of novels, mostly bad prose, has appeared; two films have been released, one Juraj Jakubisko's monumental 2008 look at the Blood Countess entitled Bathory (though only screened in the U.S. at a film festival, and not yet available on Netflix). The history of the Countess has been sadly neglected since McNally's groundbreaking first modern attempt in 1983. Until now. Stepping in is attorney and legal sleuth Kimberly L. Craft with Infamous Lady: The True Story of Countess Erzsébet Báthory. The publication of this book is the most important milestone in Báthory research since McNally's volume and, with a few caveats, is the first book to read about the historical Mistress of Cséjthe. Craft tackles the main mythology right up front, noting the oft-repeated stories that are questionable (including a linchpin of my own opera, the servant sewn into the horse, along with the relationship with Klara; fortunately Anna Darvulia stands up to the Craft test). Her history of the family and local events is thick and condensed and even the sadly neglected husband Ferenc Nádasdy is at last provided with a biography that includes the correspondence and events that led to his marriage to Erzsébet. Craft's initially terse and rapid style runs facts up against each other -- birth dates, names, places -- to make a dense mat of text. It may weary, but hardly as much as the turgid gothic prose of most writers on the subject; it is in its own way refreshing to be presented with the reality rather than untutored opinion about turn-of-the-17th-century life. The author's language becomes more colorful with the description of the Báthory-Nádasy wedding, but lapses back to facts when giving an account of the Countess's daily activities. Indeed, this factual treatment of ordinary life reveals the quotidian side of royal behavior; letters in typically florid, formal and mutually deferential style might in modern times be condensed to scrawled memos that read, "don't forget the orange juice." Solid -- and welcome -- time is spent detailing the sparse information about Erzsébet's children, a much-needed recitation of facts after centuries of mystery, implication, and outright fiction. Craft comes to no conclusions, acknowledging that more research still needs to be done from the scraps of evidence surviving from four centuries ago. It is not until a third of the way into the text that the author gets to what she calls "Strange Goings On" -- where goth fans will likely flip first in Infamous Lady. They will not be disappointed, as Craft offers them text infused with conversations and action, abandoning the careful history-professor monologue for storytelling. They might be disappointed in the author's avoidance of thick prose or portentous implication (as one might read in Penrose's accounts, or even McNally's) in favor of words such as "scandal" and a cautious sidestepping of the image of a madwoman in favor of one with a "pathology" in a historical context. This approach is laudable, as the work on this website and the Báthory opera has always sought to discover how reason and passion come into conflict within the personality of a brilliant mind. The author's treatment of Erzsébet after Nádasdy's death is logical and careful, debunking myths of blood-bathing and self-involvement with her beauty while demonstrating the likely truth in her torture of servants and fall into debt. At this point history becomes clouded further, and Craft appears to depend on testimony, much obtained under torture; as she does not indicate her sources in the text, it is difficult here to distinguish fact from interpolation or conclusion. Nevertheless, the author is at her best when recreating the complex events and near-conspiracies surrounding the Countess's arrest (with the plain title, "The Proceedings Against the Countess"). There is a sense that Báthory had lived not only past her youth and strength, but also beyond the safety of friendships, loyalty, family, religion or even political affiliation. Once again, lawyer Craft does not make conclusions for the reader, but merely points the way. The casual reader will stop there, but the historian will likely be pleased that Craft organizes and publishes a cache of documents, some not before translated into English, including transcripts, orders, letters, drawings, etchings and paintings. For the appendices alone, Craft's book both encompasses and surpasses McNally's. Still, Infamous Lady's flaws are many, and word has it that the next edition will fix them. In this first edition, credit is not given to the translator, although Craft implies it is herself. The writing is erratic and sometimes colorless and plodding, the layout unhandsome word-processor output and the book weakly organized (in part due to the monotextural layout and presentation). Most importantly, many sources are simply absent. The bibliography (taken wholesale from this bathory.org website) is dated, sources (especially of photographs, paintings and engravings) are uncredited, the writing needs professional editing (the voice changes from first person to third willy-nilly, for example, and some names and places are printed with accurate diacriticals while others are not), and most significantly for a work of non-fiction correcting historical errors, it lacks an index. The absence of an index alone keeps it second to McNally in usefulness. Fortunately, the book is self-published, putting changes directly in Craft's hands -- and she says improvements are on the way. 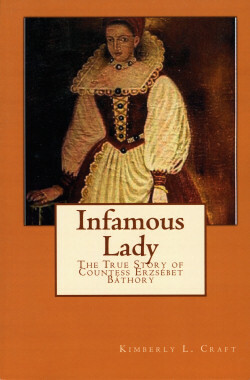 Despite the book's flaws, Báthory enthusiasts will require Infamous Lady in their collections, if only to dispel the many myths (some of which were repeated on this very website) surrounding the Countess, her life, her entourage, her trial and her death.